These clean, comfortable and spacious studios overlook the garden area. They offer exceptional value. 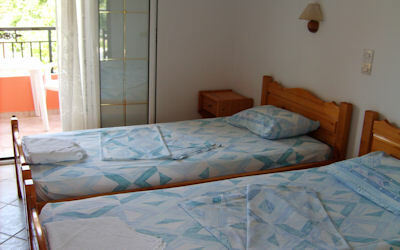 The bedrooms are simply furnished and contain twin beds, bedside table, dressing table and large wardrobe. They are also equipped with Satellite TV and Air Conditioning. 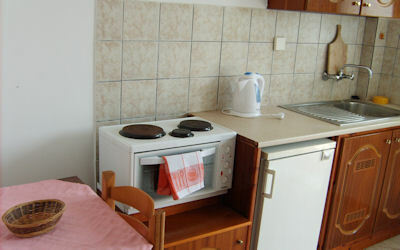 The Kitchen area is well equipped with a small cooker with 3 rings and an oven/grill, fridge, kettle, cutlery & crockery and a table and chairs. In fact, everything you will need if you wish to cater for yourselves. 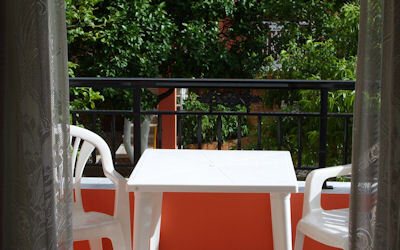 Every room has a Balcony or Terrace with a table and chairs, so you can take drinks and meals outside or simply sit and enjoy the scenery. Views from Dionyssos 2 are over the Gardens. The bathrooms are compact but functional. They contain a Shower (with Shower Curtain), Wash Basin, WC, Bathroom Cabinet and Hairdryer. Please use the contact form to enquire about availability.